I'm about to sit down and watch an election debate which will feature seven people. The two men who are in the running to become British Prime Minister - the Conservatives' David Cameron, and Labour's Ed Miliband - will line up alongside the leaders of the Liberal Democrats (current partners in the coalition government), United Kingdom Independence Party (Eurosceptic populists), Greens (much the same as the Australian version, but less significant), Scottish National Party (surging and coalitionally important Scottish nationalists), and Plaid Cymru (not surging and not coalitionally important Welsh nationalists). So it's as good a time as any to investigate why the overall majority seems to be dead, and hence why all these scattered parties are getting their time in the sun. In 2010, for the first time since 1974, the general election didn't produce a majority for any single party. 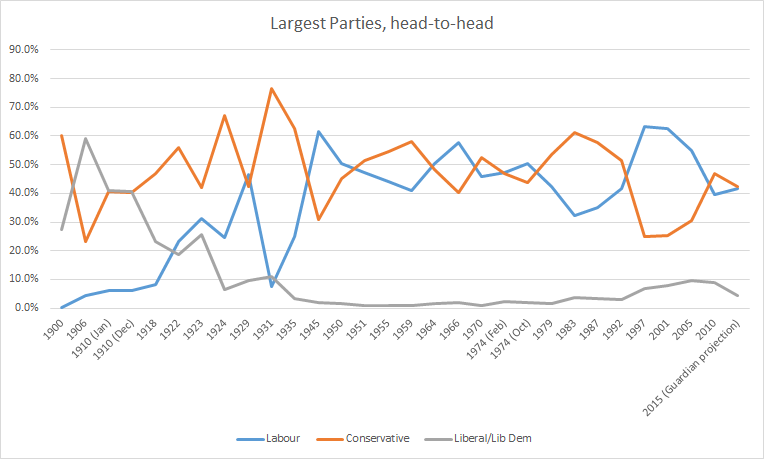 Eventually, the Conservatives - the largest single party - made a coalition agreement with the Liberal Democrats. It was the only really viable coalition, and probably the most ideologically unified, but they're still slightly odd bedfellows: the Lib Dems are a fairly straightforward liberal party, which puts them onside with the Tories as far as a lot of business deregulation goes, but they're much more progressive on constitutional issues like the House of Lords, and much more pro-European. It's been a bit awkward. On the way the Lib Dems caved in on increasing university tuition fees which their leader Nick Clegg had promised to eliminate altogether; that and various other perceived betrayals have meant they're likely to lose about half their seats at the election. Projections suggest there's going to be another hung parliament, and another coalition government. Perhaps the most natural interpretation of all this is that the two major parties are declining in popularity and the smaller parties are carving a niche for themselves. But that's not really true. 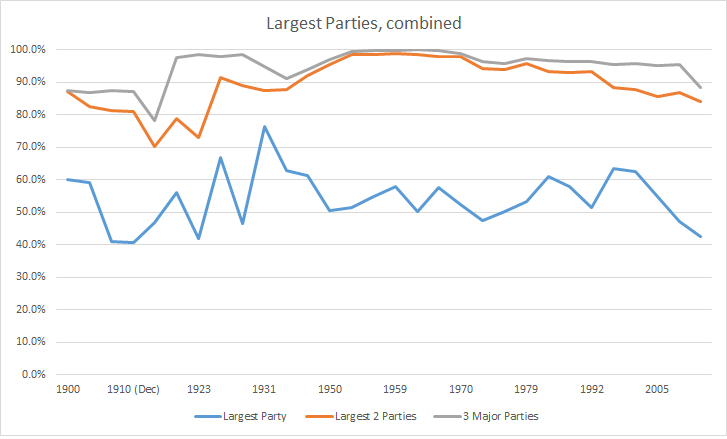 Here you can see the share of seats in Parliament held by the largest party, the largest two parties, and the three major parties, at every election since 1900. (I've included the current Guardian projection for 2015 as the final data point. The top two parties are Conservatives and Liberals until the early 1920s, when it flips to being the Conservatives and Labour.) There is a clear decline in the seat share of the largest party in the last few elections, which corresponds to the apparent development of a new 'era of coalitions'. But it's not matched by any decline - except the very slow one that started about forty years ago - in the total strength of the biggest two parties. Here you can see the point even more clearly. What's changed, basically, is that we're just not going to see at this election the kind of big swings that have characterised government changes in the UK: the two parties are claiming about the same total share, but very evenly instead of with big oscillations. It's sort of impossible to say whether that will be a trend into the longer term. It's imaginable that, despite first-past-the-post, the future is one where Labour and the Tories continue to dominate but are never quite able to form government by themselves. If that happened, at least some of the minor parties would become significant and more entrenched players even with small bands of MPs. But that would be the strength of minor parties being created by this new age of coalitions, not leading to it. Meanwhile, the seven-player leaders' debate is wrapping up. As you'd expect, it was pretty chaotic and the dynamics were really weird. I have no snap call on a winner and am not even sure how you're supposed to pick one from seven candidates, two of whom only represent certain regions and only two of whom are in the running for PM. I was quite persuaded by Ed Miliband, but he buried some of his most important points in small asides and responses which got drowned out in the chaos - and most of what came out more clearly was very bland. Nicola Sturgeon was convincing, and interestingly pitched to non-Scottish voters in a way that might help detoxify the prospect of a Labour-SNP government. Nigel Farage sounded ridiculous, but to me he always does, so it's hard to know if that means anything; Leanne Wood and Natalie Bennett (Plaid Cymru and the Greens) made no real mark; and Nick Clegg was comical in trying to claim the middle ground and position himself for coalition with either Labour or the Tories. All of which, I think, is good news for David Cameron - he didn't want a debate that might risk his status as the most popular leader, and he got a pretty low-impact one.